Boucherouite rugs are specific to Moroccan berber tribes. In these, often very modest, households, the Berber women weave Boucherouite rugs out of discarded scraps of material. A thousand scraps of cotton, nylon and occasionally wool are woven into these fabulous Boucherouite decorative creations. 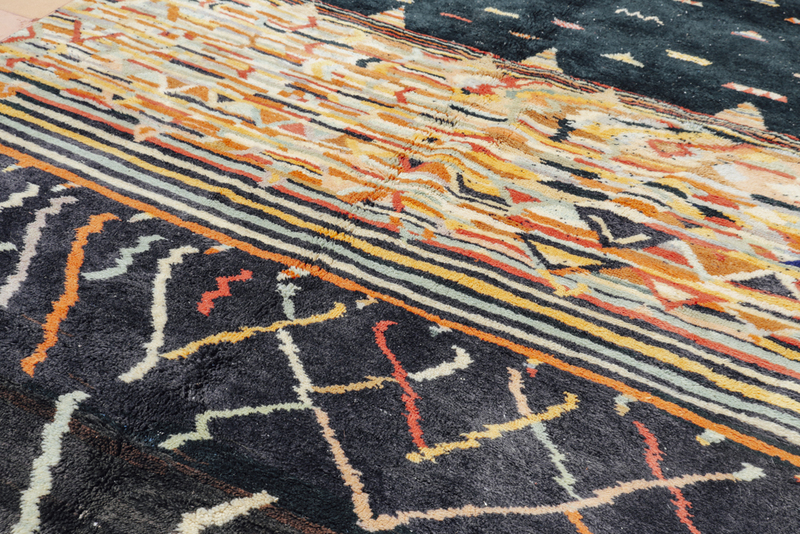 Woven from long strands of wool from a special breed of Berber sheep, Beni Ourain carpets were originally created as bedding for the Beni Ourain nomadic tribe who inhabited the Atlas Mountains. The designs are incredibly unique and the patterns are beautiful, striking, and surprisingly contemporary. Lattices, diamonds, zig zigs, and criss-cross, all trimmed in a knotted fringe. Known as Moroccan wedding blankets, handira are woven out of sheep's wool, cotton and linen by Berber women in the Middle Atlas mountains of Northern Morocco. Berber wedding blankets are woven in anticipation of a wedding, by the bride's female relatives.After the wedding ceremony, the bride wears the blanket tied around her neck as a kind of cape. The wedding blanket serves not only as warmth and decoration for the bride, but also to ward off evil and to bestow fertility and good luck upon the newlyweds. Azilal Rugs or Azilals, as their name suggests, originate from the craggy and steep Azilal (Moroccan Berber Region), located in the remote and hard to reach High Atlas mountains, in the south of the city of Beni Mellal , about 180 km North-East Marrakech. Only performed by women of this region, Azilal rugs are made from virgin raw wool by alternating composed patterns of one single knotted line and one or two woven lines, according to a cultural ritual that mothers are passing down to daughters for generations.